Most people in Colorado have never heard of this micro-winery, bistro and bed and breakfast nestled in the foothills west of Denver. You might have seen Aspen Peak Cellars mentioned in the news this past summer. Unfortunately, it was because their 135-yr old barn burned down due to a lightning strike. However, Marcel and Julie Flukiger have not let this catastrophe deter them from doing what they love. In fact, they have a new tasting facility opening in a few weeks! Originally from Switzerland, Marcel met Julie almost twenty years ago while they both worked at the Brown Palace Hotel in Denver as chefs. Fast forward to 2009, and Aspen Peak Cellars at the Clifton House was born. 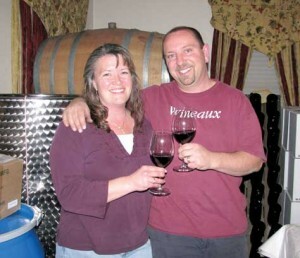 Thank you, Marcel and Julie for being a part of our "Meet the Winemaker" interview series! I gave Julie a wine making kit for Christmas 7 years ago. The hobby turned out to be a lot of fun and quickly got out of control. Our background is in the restaurant business, as we both are trained chefs. Most likely that is what we would be doing. The few days outside the winery we enjoy family time with our daughter, Chantel. We love traveling, camping, 4-wheeling, and hiking. Marcel also the president of the Platte Canyon Area Chamber of Commerce. There is something about Tuscany with it's culture, landscape, food and tradition that would be hard to pass on. 2004 Clio by Bodegas El Nido, Jumilla, Spain. It is a blend of 30% cabernet sauvignon and 70% monastrell and is a wonderful effort by a New World winemaker with Old World grapes. An emerging region with potential of becoming a producer of great wines, mostly likely will be known for their Bordeaux varietals and blends. With help of continuing education classes, aging of the vineyards, conversions from orchards to vineyards, and an extra ordinary marketing plan, Colorado wine can be competitive for decades to come. What are the determining factors for you to consider buying more Colorado wine? Quality first. Then price. It has to be a good wine worth the money it costs.